Beautifully restored trulli and a contemporary villa with pool, where al fresco living reigns supreme. With its delightful gardens, abundant outdoor living and dining spaces and seductive pool, Trullo Alice is a superb summer house for those who love an al fresco lifestyle. Inside it offers all the comforts of modern living combined with a homely, relaxing atmosphere that will immediately set you at your ease. Pool open from 30th March to 1st November. Inside: accommodation is spread over two houses: the original trulli and a contemporary villa. A covered terrace runs along the entire length of the villa’s façade, from where one may access the three welcoming bedrooms, two doubles and a twin bedroom, each with its own en-suite shower room. These bedrooms are accessible only from the exterior and do not communicate with each other. Another set of French windows leads in to the lovely modern country kitchen-diner, which also opens out on to the other side of the house and seamlessly serves the main al fresco dining area. The kitchen is also home to a comfy sofa and TV. Cool, light-coloured stone floors run throughout and fixtures and fittings are all of an excellent quality. A path leads from the villa to the trulli, which have been restored with great attention to detail. Many of the original features have been retained and one gets a real sense of the building's history. Access is via a shady outdoor living area, which gives into a cosy living room with fireplace. To one side is a small kitchen (suitable for breakfast preparation) and an elegant bathroom with double sinks and a tub with shower. To the other is a study area with sofa and two bedrooms: a double and a single both with their own garden access. Quality fixtures and fittings perfectly complement the original light-coloured stone walls. Outside: Trullo Alice is designed with summer living in mind and the outside areas offer numerous possibilities for lounging, dining and recreation. The lawned gardens, which are delimited by traditional dry-stone walls, are beautifully maintained and feature a variety of fragrant Mediterranean shrubs and numerous centuries-old, gnarly-trunked olive trees. On one side of the villa is a long shaded terrace, while to the other, also accessed from the kitchen, is a large shady al fresco dining area served by a built-in barbecue, a lounging pagoda and the enticing pool. Glorious views spread out across the surrounding countryside with the Adriatic Sea in the distance. A gravel path leads for about 20 metres through the manicured lawns to the trulli’s comfortably furnished, languor-inducing terrace, whose gently billowing curtains and white canvas roof offer welcome repair from the hot afternoon sun and a perfect location for breakfasts. Book just the villa or the villa and the trulli, you'll always have exclusive use of the grounds and pool! The bedrooms in the villa are accessible only from outside and do not communicate with each other or the kitchen internally. Trullo Alice is situated about 5km north of the town of Fasano. The rolling Puglian hills around the villa are dotted with centuries-old olive groves producing some of the world’s finest olive oil, and several picturesque towns and villages, including Alberobello, Cisternino, Locorotondo and Ostuni. These towns all have regular markets as well as a selection of typical bars and trattorie. A little over 10 minutes' drive away are a series of sandy beaches. 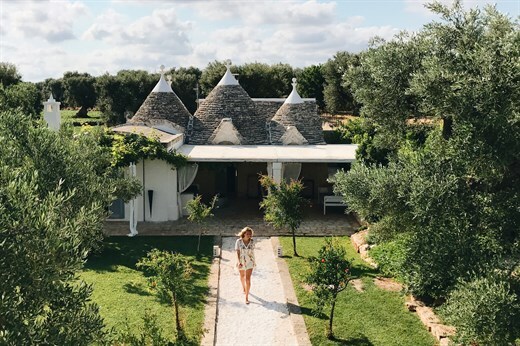 An extremely attractive feature of Trullo Alice is undoubtedly that Think Puglia guests may reach lovely beach clubs, golf courses and spa nearby. Other world class sites within an easy drive include the Baroque centre of Lecce and the stunning walled coastal towns of Otranto and Gallipoli. "We had a fabulous stay at Trullo Alice and I want to complement all the staff at The Thinking Traveller for making this the most the memorable vacation. Your attention to detail, responsiveness, timing and assistance is exemplary!" Trullo Alice is a lovely villa in lovely surroundings and a good location. All in all we were very happy and would def book through you again. Service was great. We had a fabulous stay at Trullo Alice and I want to complement all the staff at The Thinking Traveller for making this the most the memorable vacation. Your attention to detail, responsiveness, timing and assistance is exemplary! Kol Ha’Kavod! as we say in Hebrew, which literally means ‘all the honour’ but is used to compliment someone for an excellent job. You’ll be hearing from me when next we need a house! This was a fabulous vacation and that does not happen by accident. Trullo Alice was beautiful and perfect for our needs. The lady who came to clean each day, was an angel. The setting was beyond picturesque - a lovely villa among 100 year-old olive groves with no other buildings in sight. I can't say enough. We had a fantastic time, a magical week, thank you for everything. Trullo Alice and grounds were just lovely. Perfect for our family. The housekeeper who came daily, was wonderful too. This was a fabulous vacation. We would absolutely book again through you. We like exploring more of the undiscovered which is in sync with your philosophy. Overall, I feel like The Thinking Traveller is an ideal match for my vacation style! The housekeeper was fantastic, the best we have had in villa rentals over the years. She kept the house immaculate, nothing was too much trouble and her advice about local attractions was first rate. The villa was lovely, incredibly well kept. We were really happy with the villa. The outdoor area was absolutely amazing and - the nicest and most functional of any villa we have ever stayed at. The indoor layout / set up was surprisingly functional. The staff were absolutely excellent with hands down the best cleaner of any villa we have stayed at. The house worked perfectly for us. We loved it all so much! We thank all The Thinking Traveller for the preparation of our vacation and assistance. They have done an excellent work, especially the local support team: extremely kind and helpful, always available with help and advice. Thank you. We will definitely recommend you to our friends and looking forward to discovering other places. We are thinking about Sicily next year. The house is beautiful, the surrounding countryside stunning... A wonderful holiday... we are thinking of coming back next year. Wir haben genau alles so angetroffen, wie in Ihren Bildern präsentiert :-).